You are here: Home / 2015 / The Mindjammer Kickstarter – Final Week! The Mindjammer Kickstarter – Final Week! We’re delighted to announce that the successful MINDJAMMER KICKSTARTER campaign is now entering its final week. Launched on the 17th November to fund a massive expansion of the far future transhuman science-fiction and roleplaying game setting, the Kickstarter achieved its initial funding goal in 24 hours, and has since been unlocking exciting stretch goals featuring new supplements, sourcebooks, fiction, and adventures. We’ve been absolutely thrilled by your response. You’ve given us such awesome feedback and contributions, and enabled us to unlock some fantastic goals: right now we have two adventures, a sourcebook for the Venu, an entire fiction collection, a player’s guide, a companion, an introductory adventure, an enhanced poster map of the Commonality, and even a Traveller version of the game! Now that we’re entering this crucial final week the Kickstarter is amazing value, and we’re hoping that even more of you will come on board and help us unlock still more books for your far future transhuman science fiction games. £45 / $67.50 PRINT + PDF CORE MASTER: Ideal if you’re getting into the Mindjammer RPG for the first time, this pledge includes physical print copies and digital versions of the MINDJAMMER RPG core rulebook, the HEARTS AND MINDS adventure, and THE CITY PEOPLE adventure; as well as digital (PDF) versions of everything released by the Kickstarter, which so far includes: the MINDJAMMER PLAYER’S GUIDE, the CITY PEOPLE Digipack Graphic and Map Resources, MINDJAMMER TRAVELLER, the MINDJAMMER COMPANION, the adventure BLUE, the MINDJAMMER novel, the novel-length short story collection SONGS OF OLD EARTH, the ENHANCED COMMONALITY SPACE SCHEMATIC, and CHILDREN OF ORION—the Venu sourcebook. £20 / $30 PDF MASTER: Perfect if you already have the MINDJAMMER RPG core book, this great value pledge offers everything released by the Kickstarter in digital (PDF) format, which so far includes: the adventure THE CITY PEOPLE, the MINDJAMMER PLAYER’S GUIDE, the CITY PEOPLE Digipack Graphic and Map Resources, MINDJAMMER TRAVELLER, the MINDJAMMER COMPANION, the adventure BLUE, the MINDJAMMER novel, the novel-length short story collection SONGS OF OLD EARTH, the ENHANCED COMMONALITY SPACE SCHEMATIC, and CHILDREN OF ORION—the Venu sourcebook. That’s ten products for just £20 / $30! £25 / $37.50 PRINT + PDF MASTER: Perfect if you have the MINDJAMMER RPG core book and would like a physical copy of the new adventure THE CITY PEOPLE, this pledge includes a print + PDF copy of the adventure THE CITY PEOPLE, and digital (PDF) versions of everything released by the Kickstarter, which so far includes: the MINDJAMMER PLAYER’S GUIDE, the CITY PEOPLE Digipack Graphic and Map Resources, MINDJAMMER TRAVELLER, the MINDJAMMER COMPANION, the adventure BLUE, the MINDJAMMER novel, the novel-length short story collection SONGS OF OLD EARTH, the ENHANCED COMMONALITY SPACE SCHEMATIC, and CHILDREN OF ORION—the Venu sourcebook. 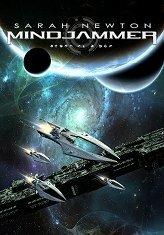 The MINDJAMMER RPG core book: 496 pages, hardback. The adventure HEARTS AND MINDS: 80 pages, paperback. The adventure THE CITY PEOPLE: 80 pages, paperback. The MINDJAMMER PLAYER’S GUIDE: 160 pages, paperback. The ENHANCED COMMONALITY SPACE SCHEMATIC POSTER MAP: A2 / ANSI-C size. All in all great Kickstarter value—and we’re still unlocking new stretch goals almost every day! Full details, descriptions, previews, graphics, and more can be found at the Kickstarter page at http://tinyurl.com/jammerkick—so please drop by and pledge before Sunday the 20th December, and help fund this massive expansion of our far future transhuman science-fiction setting! MINDJAMMER. BEYOND THE HUMAN FRONTIER. « The Mindjammer Kickstarter – Open Now!